Thick Milk: Add 2-3 tablespoons of Renuka Coconut Milk Powder into one cup (150ml) of lukewarm water, stir well. 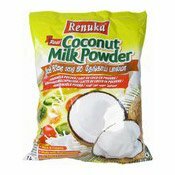 Thin milk: Add 1 tablespoon of Renuka Coconut Milk Powder into one cup (150ml) of lukewarm water, stir well. Once opened store in a dry place. Use dry spoon. Ingredients: Coconut Kernel Extract, Maltodextrin, Milk Protein (Sodium Caseinate), Acidity Regulator: Tri Sodium Phosphate (E339[iii]).